A couple of weeks ago, I was pulling quilts out of the room where Mom had stored them in preparation for bringing them home to photograph them for our online photo album--we're posting pictures of heirlooms and potential heirlooms so all the sibs can go through them to indicate which they'd have interest in. I was short on time that day, so although I'd inventoried some items at the house, I had decided I'd grab the quilts and take them home with me to finish at a later date. I emptied out a bureau where I knew she kept many of her quilts, then noticed what looked like more quilts sitting on the upper shelf in a closet. They were mostly in plastic bags, so although I could tell they were probably quilts I couldn't see much more than that. I shooed Mom's cat off the top of them and started pulling them off the shelf and handing them to my daughter, nieces, and nephew (the day's designated helpers) to load into my car. As I pulled one bag off the shelf, the bag opened a little bit and I realized that I had probably found an antique quilt I'd been keeping an eye out for. It's a crazy quilt that we weren't positive whether it had been given to Mom or was only on loan. We'd found some paperwork about it, but hadn't yet seen the quilt. I tugged open the bag a little further.... Yep. Definitely a crazy quilt. I handed it off to one of the kids, warning them to be particularly careful since it was likely an antique, then continued to pull the rest of the quilts off the shelf. 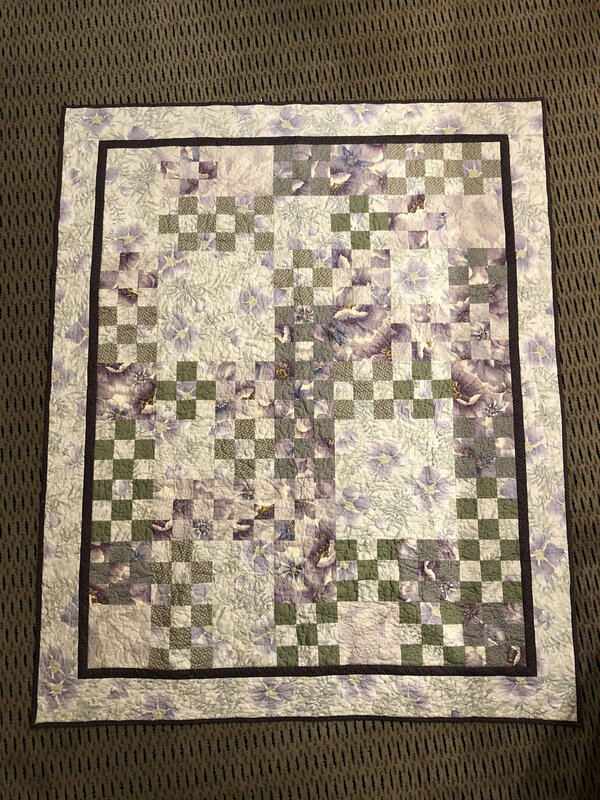 I noticed a couple were unfinished pieced tops, so I thought maybe one of them was a set of blocks that had been given to Mom by the same person as the crazy quilt--the plan had been to finish the blocks into a quilt. All we knew about the blocks was that they were supposed to be from the 1850s or 1860s--nothing about pattern or colors or anything. I glanced at the unfinished tops and although they didn't look quite that old to me, I don't know much about fabric-dating so I shrugged, again warned whatever kid took them from me to be careful, and moved on. When I got home, the quilts were sent up to my sewing room while the rest of the car load went to the basement. I was far too exhausted to even think about the quilts anymore that night--I just commented to Chris that I thought I'd probably finally found the mystery quilt and blocks, and then didn't pursue it any further. 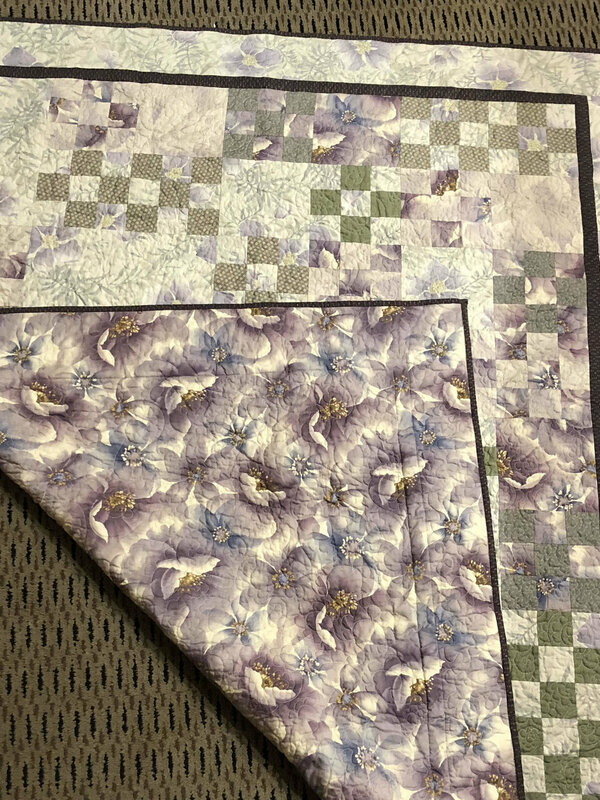 The next day, though, I planned to do some sewing--which necessitated moving the quilts which had now been stacked all over my cutting table and surrounding floor. I decided to check them out before I moved them, and started pulling them out of the bags. The first to be opened was the crazy quilt. Yep, definitely an antique crazy quilt, so that mystery was solved. Found it! However, Mom hadn't included any further documentation in with the quilt so I still didn't know if it was actually hers or not. Next, I flipped open one of the unfinished pieced tops. Huh. Very strange pattern. Could it have been 1850s? Possibly, but I wasn't quite feeling it. Still trying to be optimistic, though, I decided that maybe I wasn't understanding the documentation correctly and the blocks weren't supposed to be that old, or maybe I was just way off in my very little knowledge of fabric dating. I dubbed it the "Paramecium quilt" (The applique pattern is truly unique). The second unfinished pieced top was more attractive--a variation on a Dresden Plate. Still didn't look old enough to me, but hey, what do I know? Neither top had any documentation on them at all. The next quilt I opened was finished--a beautiful Lone Star. Clearly hand quilted. I had no idea of the age of this one because it's all solid fabrics (prints are easier to date), but Mom had pinned an index card to the side of it that simply said "Antique Lone Star." OK, well, thanks, Mom. I could've figured that much out! No indication of the age or the maker. Next, a huge--HUGE--and extremely heavy quilt that's appliqued tulip blocks. Very cute, and to me it looked definitely 1930s. I've seen enough 1930s reproduction prints to have a pretty good sense of that time period, and the fabrics weren't new enough to be repros. No documentation. Finally, I pulled the last quilt up to my cutting table and flipped open an edge. Oooh. Pineapples. One of my favorite designs. Clearly hand-quilted. Wow--look at that quilting--wonderful! I felt myself start to get a little choked up as I opened the quilt further and began to take in the full effect of the pattern. It's gorgeous. Here I am, someone who has never been an afficianado of antique quilts per se, and I was very swiftly falling in love. I kept flipping it open and scootching it around on my cutting table, and suddenly came across another pinned label in Mom's handwriting. This time, the label was from the Big Tree Quilt Conference--Mom had obviously displayed this at one point. The label read: "Name: Thistle Quilt. Maker: Mrs. Bixby. Year: 1891. Owner: Shirley DeMott--Shirley's great-great-grandmother." Stuffed in the back of a closet, hidden from view and nothing Mom had ever mentioned to me that I could recall, was this beautiful piece of my family history. An antique quilt from the 1890s? You've got to be kidding me. Mom--why hadn't you told me? I grabbed the antique quilts and layed them all out on my bed so I could see them better, then ran to find every family member in my house at the moment and dragged them upstairs to see what I had found. I still choked up every time I looked at the pineapple/thistle quilt. We looked for signatures or any indication whatsoever of who had made the unlabeled quilts, to no avail. Later that night, I called my Mom's best friend Margie and asked her if she knew anything about these quilts. She remembered that my Aunt Jean had given Mom two of them--they were family quilts. Since Mom never bought an antique quilt to the best of my knowledge, my only assumption can be that they're all family quilts (except the crazy quilt). I called Aunt Jean (Mom's older sister) next. 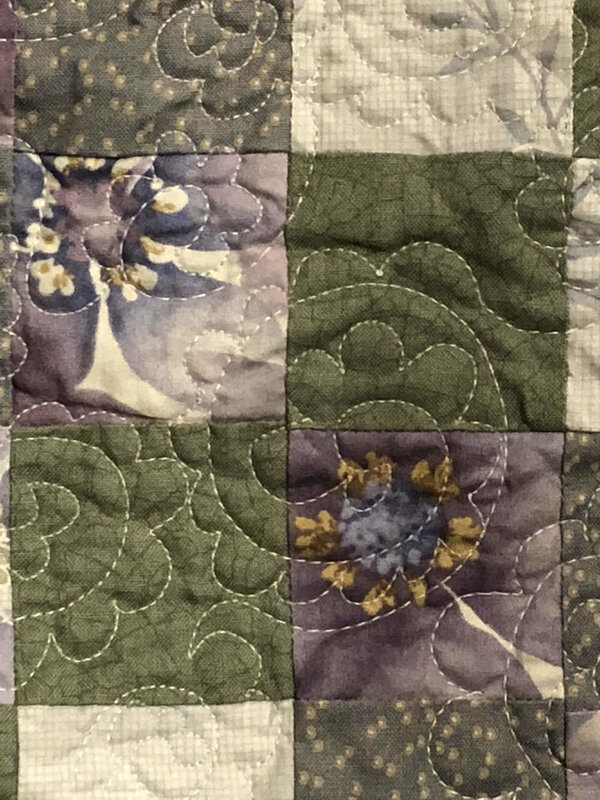 She had owned the tulip quilt and the pineapple/thistle quilt--she'd inherited it when their grandmother, Grandma LaBelle, had passed away. She'd used the tulip quilt on her own bed and the pineapple/thistle quilt had been on my cousin's bed. She'd given them to Mom when she moved to Florida. 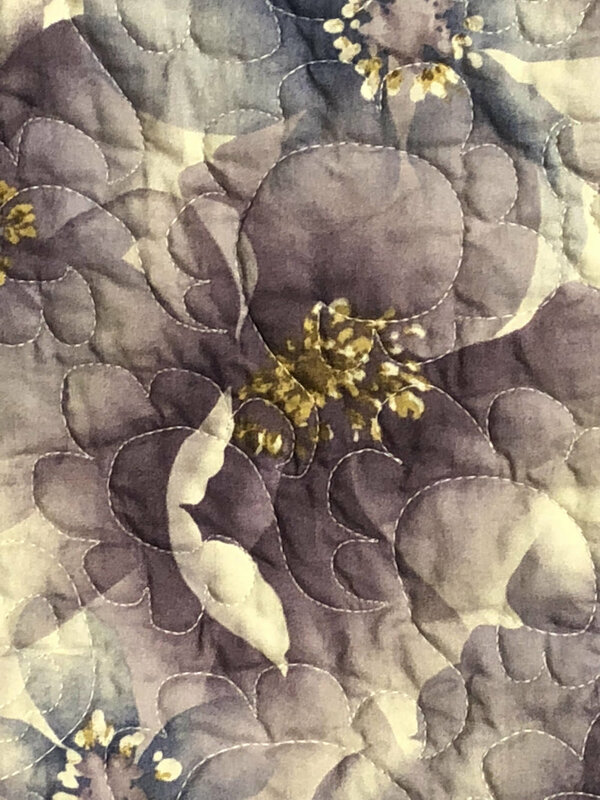 She said that Grandma LaBelle had made the tulip quilt, but had no more information on the pineapple/thistle quilt than what Mom had put on the label. She knew nothing about the other quilt or pieced tops. I also called my Aunt Ginny (Mom's younger sister). Aunt Ginny didn't know any more than what I'd already been told, although she mentioned to me in a later conversation that Aunt Flo and Aunt Lea (Grandma LaBelle's sisters) had also been quilters, although Aunt Lea less so, apparently. I decided at that point to take all of the quilts to a quilt appraiser--not so much for monetary value, although we probably needed to know that for the estate--but I really wanted to know what time period they came from to see if I could figure out what relative may have made them. The results of the appraisal? That'll be the next blog entry lest this turn into a novella!